In places where High Sierra changes control elements, such as checkboxes, popup menus, and radio buttons, Helix reflects this new design style, making your collections ‘fit right in’ in High Sierra with no (or only minor) design changes required. Helix 7.0.3, released on September 26, 2017, is fully compatible with High Sierra. The availability of Helix 7.0.3 (and later) means we will not be addressing High Sierra compatibility issues discovered in older versions of Helix. Helix 6.2.x compatibility with High Sierra is untested. Review the Yosemite and El Capitan compatibility notes before upgrading if you plan on continuing to use Helix 6.2.x. Warning! A bug has been identified in macOS 10.13, when running on SSD (solid state drive) volumes. See this article by the author of Carbon Copy Cloner, who discovered the bug. Experience from others in the field suggest that the problem is bigger than he reports. Until this bug is addressed by Apple, we suggest that you exercise caution when running Helix collections on SSDs with Apple’s new APFS volume format. Helix RADE 7.0.x releases are compatible with High Sierra. Helix RADE 6.2.x releases are untested. See note above. Helix RADE 6.1 and earlier are not compatible with High Sierra. Helix Server 7.0.x releases are compatible with High Sierra. Helix Server 6.2.x releases are untested. See note above. Helix Server 6.2.1 and earlier are not compatible with High Sierra. Helix Client 7.0.x releases are compatible with High Sierra. Helix Client 6.2.x releases are untested. See note above. Helix Client 6.2.1 and earlier are not compatible with High Sierra. Helix Engine 7.0.x releases are compatible with High Sierra. Helix Engine 6.2.x releases are untested. See note above. Helix Engine 6.1.x has not been tested. We recommend updating to Helix Engine 6.2.4 or later. Helix Engine 6.0 and earlier are not compatible with High Sierra. Helix Utility 7.0 and later are compatible with High Sierra. Helix Utility 6.2.x releases are untested. See note above. Helix Utility 6.0 and earlier are not compatible with High Sierra. 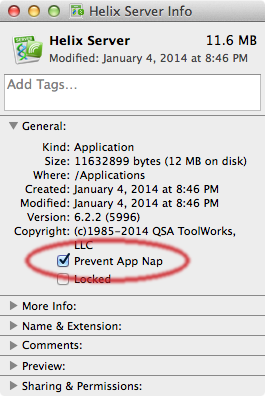 macOS 10.9 introduced a new feature, called App Nap. This feature monitors running applications to determine what priority each should get in terms of processor, network and disk resources. Because the ‘Refresh’ button is found in the toolbar, Helix 6.2.2 and later automatically opens the toolbar when a cold form is opened. Users who dislike this feature can disable it by editing the HxShowToolbarForColdForm preference. See this page for details. The collection updating function performed by Update Collection has been added directly to Helix 7.0, with support for updating collections from Helix Express 3.5 and later. Update Collection is officially discontinued. The structure checking function performed by Update Collection was added directly to Helix 6.2, making this product unnecessary for collections previously updated to Helix 6.x. To use an older collection with Helix 6.x, it must be updated to Helix 6.0/6.1 using a machine running macOS 10.6 (Snow Leopard) or earlier. See this technote for options available to update older collections. Update Collection OS X — whose most recent update is version 6.0.1 — is not Intel-native and therefore not compatible with macOS 10.7 (Lion) or later. Helix Maintenance Manager 1.0.x is compatible with Helix utilities 5.3.x and 6.0.x only and therefore not compatible with High Sierra. Helix Developer Utility (HDU) is a discontinued “Classic-only” application. Developers who require the functions of HDU should contact our technical support department for assistance. The functions performed by Helix Scripting are incorporated directly to Helix 6.2 and later, making this product obsolete. Helix Scripting — which was included in the Helix RADE Readiness Kit — is not Intel-native and therefore is not compatible with macOS 10.7 (Lion) or later.